This summer, indulged your kids in a colorful learning experience that is engaging and pays off in better critical thinking! 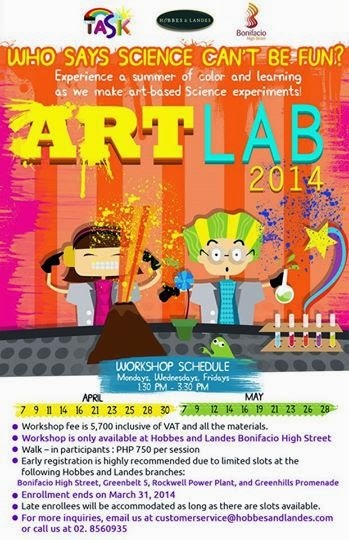 Join them in Hobbes and Landes' ART LAB 2014 workshop. This activity mixes both science and art through art-based science experiments. Let your children feel a sense of accomplishment as they progress through hands-on learning in science! Science can be so much fun when Art Techniques and Art Materials are used to perform experiments! 1st batch - April 7, 9, 11, 14, 16, 21, 23, 25, 28, and 30. - Art Lab Workshop caters to kids aged 4 - 12 years old. - Workshop fee is P 5700 inclusive of VAT and all the materials. - Workshop is only available at Hobbes and Landes Bonifacio High Street. - Walk-in participants are accommodated at P 750 per session. - One session takes two hours. There will be three moderators per class. - Enrollment ends on March 31, 2014. Do register as there are limited Hobbes and Landes slots for branches located at: Bonifacio High Street, Greenbelt 5, Rockwell Power Plant, and Greenhills Promenade. Late enrollees may be accommodated though, subject to slot availability. Visit Hobbes and Landes facebook page for updates. For more inquiries, send email at customerservice@hobbesandlandes.com or call at 8560935.